Research in CCAPS includes astrophysics theory, complex numerical simulations of extreme environments, astronomical observations, from within the Solar System to the largest cosmic scales, and the engineering design, construction and implementation of instruments for ground and space based observatories and Mars Rovers. Our observational work covers the entire electromagnetic spectrum from radio waves to gamma-rays. A wide variety of national and international observatories and satellites are utilized to conduct our research. Cassini–Huygens was a joint NASA/ESA/ASI spacecraft mission studying the planet Saturn and its many natural satellites since 2004. Launched in 1997 after nearly two decades of gestation, it includes a Saturn orbiter and an atmospheric probe/lander for the moon Titan, although it has also returned data on a wide variety of other things including the Heliosphere, Jupiter, and relativity tests. The Titan probe, Huygens, entered and landed on the moon in 2005. After two decades in space, NASA's Cassini spacecraft has ended its remarkable journey of exploration. Having expended almost every bit of the rocket propellant it carried to Saturn, operators deliberately plunged Cassini into the planet on September 15, 2017, to ensure Saturn's moons remain pristine for future exploration. 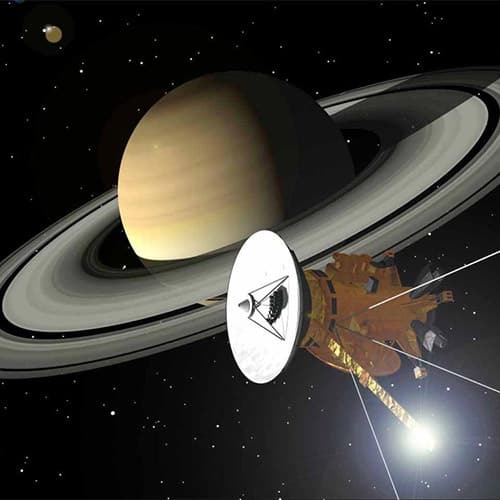 Click here to learn more about Cornell astronomers' contributions to the Cassini-Huygens mission. Click here to learn about other missions in which CCAPS researchers are involved. Click here to explore the CSI website.